Candace Sipos covered Art <=> Climate Chaos: the Artist’s Response for the Daily-News Record on November 7, 2013, here: DNRonline _ Climate Chaos. 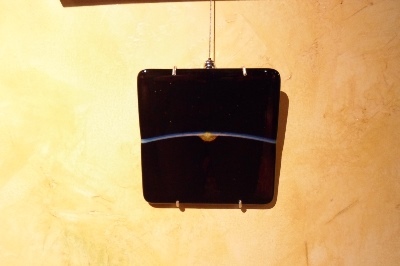 This piece was patterned after a NASA image of sunset over Earth taken from the International Space Station in 2008 (http://fettss.arc.nasa.gov/collection/details/earth-atmosphere/). Earth’s atmosphere is seen against the cold, dark void of space. The lower, lighter layer is the troposphere, where we live. It is 10 miles high and is where the greenhouse lies that regulates Earth’s temperature. Without that greenhouse, the average temperature on Earth would be 0°F, hardly a welcoming place for life. Because water vapor is responsible for about half of the greenhouse effect, carbon dioxide plays a critical role by regulating the amount of water vapor in the atmosphere, thereby preventing the greenhouse from collapsing. 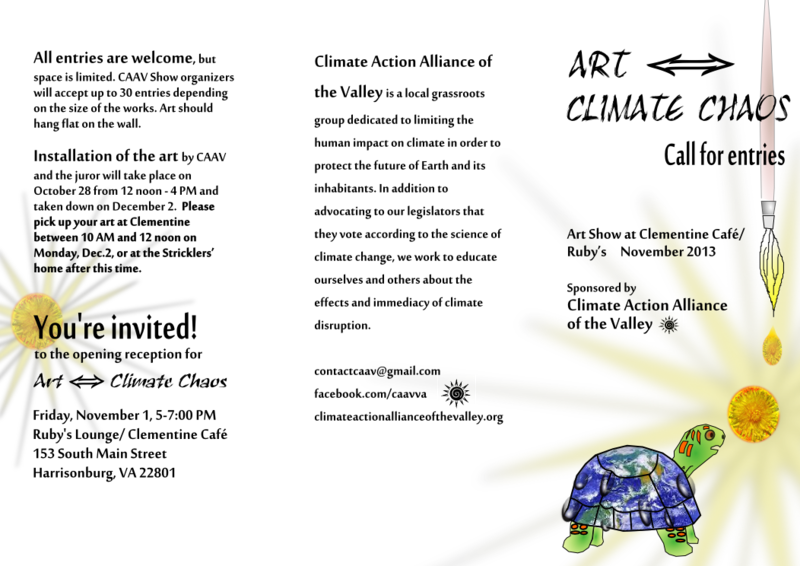 However, as the carbon dioxide concentrations in the atmosphere increases, the greenhouse effect becomes stronger and Earth gets warmer. Thanks to everyone who submitted artwork! 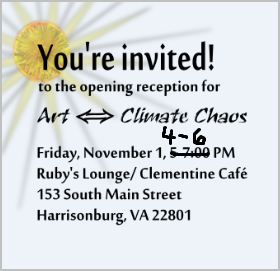 Come to the opening at Ruby’s on Friday, November 1 from 4-6 PM! Driven by man’s overuse of fossil fuels, the world’s climate is changing in many ways. When you as an artist read about floods, drought, huge wildfires, record-breaking heat, or ocean acidification, and see the devastation wrought on the natural world, as well as on human life, as it comes over television and the internet, how does it impact you? Do you try to envision a better future; do you mourn what’s lost? And how do you respond through your art? These are the two-way questions that the Climate Action Alliance of the Valley is asking you to address in your entries for ART ↔ CLIMATE CHAOS – an art exhibit at Clementine Café‘s downstairs Ruby’s Lounge for the month of November 2013. Personal reactions to the threat of climate chaos are often emotional, and are an essential component of what we learn and wish to pass on to others. Art can convey our emotional responses to this crisis, and we invite you to submit your original work to provoke the viewer as well and raise awareness. All entries are welcome, but space is limited. CAAV Show organizers will accept up to 30 entries depending on the size of the works. 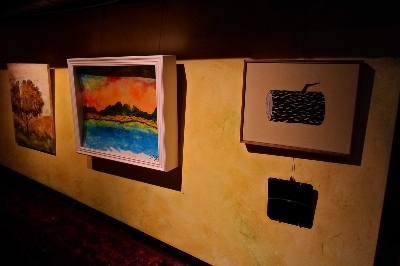 Art pieces should be able to hang flat against the wall. Cathy Strickler at 1225 Hillcrest Dr., Harrisonburg, VA 22801. 2. 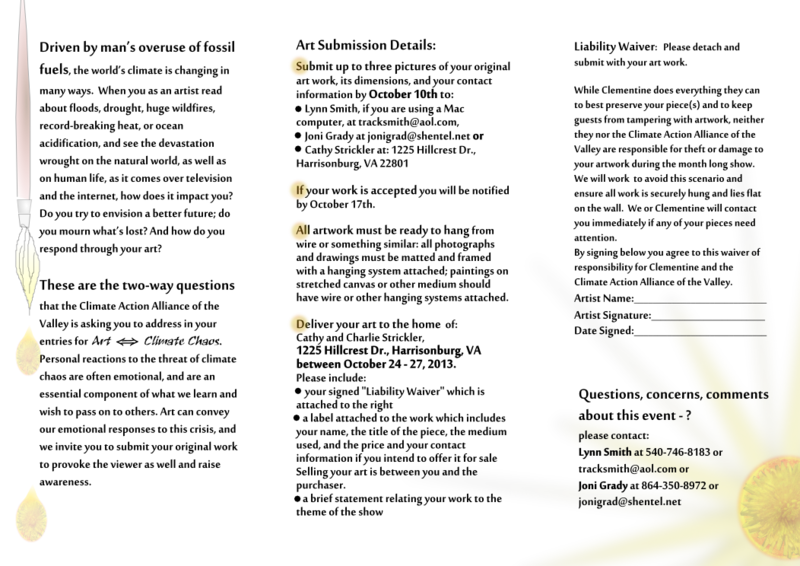 If your work is accepted you will be notified by October 17th. 3. 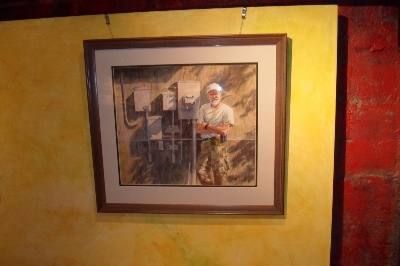 All artwork must be ready to hang from wire or other something similar: all photographs and drawings must be matted and framed and have a hanging system attached; paintings on stretched canvas or other medium should have wire or other hanging system attached. 4. Deliver your art to the home of: Cathy and Charlie Strickler 1225 Hillcrest Dr., Harrisonburg, VA 22801 between Thursday, October 24 and Sunday, October 27.
the price if you intend to offer it for sale. Selling art is between you and the purchaser, so please include contact information on the label for customers’ convenience. A brief statement relating your work to the theme of the show. 5. Installation of the art by CAAV and the juror will take place on Monday, October 28 from 12 noon -4 PM . It will be taken down on Monday, December 2. You may pick up your art at Clementine between 10 AM and 12 noon on December 2, or pick it up from the Stricklers’ home after this time. Opening reception for the Show is on Friday, November 1 from 4-6 PM (please note this time change from the original 5-7 PM time). You are invited! Please invite others to attend! 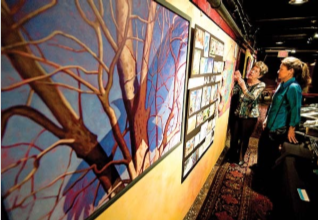 While Clementine does everything they can to best preserve your piece(s) and to keep guests from tampering with artwork, neither they nor the Climate Action Alliance of the Valley are responsible for theft or damage to your artwork during the month long show. We will work to avoid this scenario and ensure all work is securely hung and lies flat on the wall. We or Clementine will contact you immediately if any of your pieces need attention. By signing below you agree that to this waiver of responsibility for Clementine and the Climate Action Alliance of the Valley. A printable trifold version of this information is available here (outside) and here (inside). 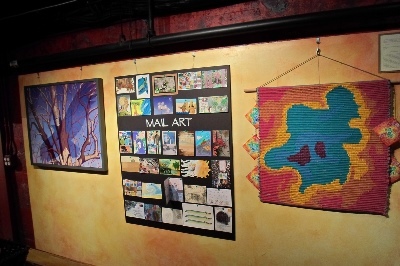 Check out CAAV member and passionate Mail Artist Judith Hollowood’s call for Climate Chaos mail art through her newly launched Climate Change Mail Art blog. “If you’re worried about climate change and you make mail art, this blog is for you. If you’re worried about climate change and are curious about mail art, it’s for you, too.” This is a fun way to contribute to the ART ↔ CLIMATE CHAOS show!